This Geekworm Raspberry Pi Installation Tool 120 Pcs/Lot M2.5 Series Hex Brass Spacer/Standoff + Nuts + Screws is perfect for your raspberry projects, you can use it to install your Raspberry Pi 3 Model B+ Plus,Raspberry Pi 3 Model B,Raspberry Pi 2 Model B,Raspberry Pi 1 Model B+ with 6 differents kind of screws or nuts. 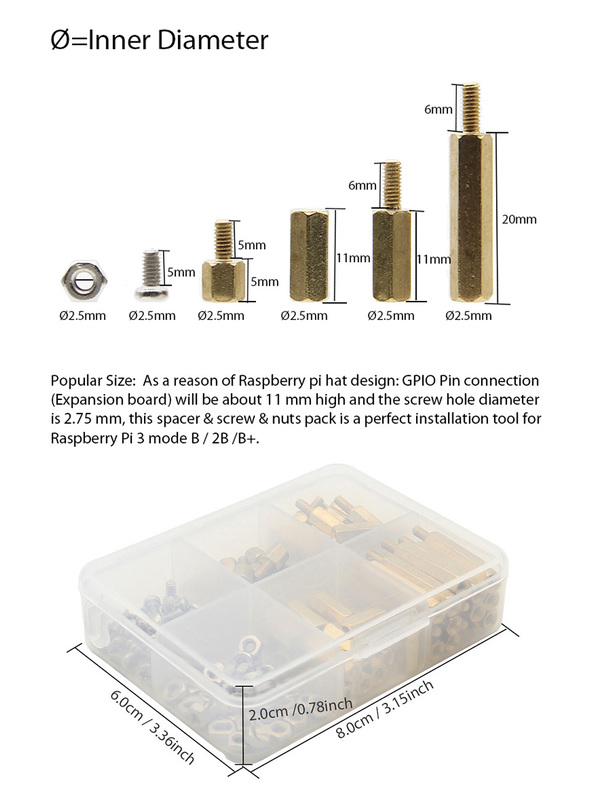 Popular Size: As a reason of Raspberry pi hat design: GPIO Pin connection (Expansion board) is about 11 mm high and the screw hole diameter is 2.75 mm, this spacer & screw & nuts pack is a perfect installation tool for Raspberry Pi 3 Model B+ /Pi 3B /Pi 2B /Pi B+. Note: The above numbers behind M are for spacer/screw/nut tooth diameter x length,the unit is mm. Example: M2.5 x 5mm Screws.